A great, all-purpose shampoo that works best when paired with a dedicated carpet cleaner." "Retains the best properties of more expensive shampoos without breaking the bank." "Meant to go deep to eliminate stains and odors." "Includes a built-in brush head that provides a deep clean through and past carpet fibers." "Completely removes the target odor so you are left with a fragrance-free room." "Safe for people and pets with allergies or who are sensitive to certain types of chemicals." All carpet shampoos use different formulas to either target specific types of messes and spills or to handle different sizes of cleanups. The very best carpet shampoo is one that tries to handle as many types of messes as possible. 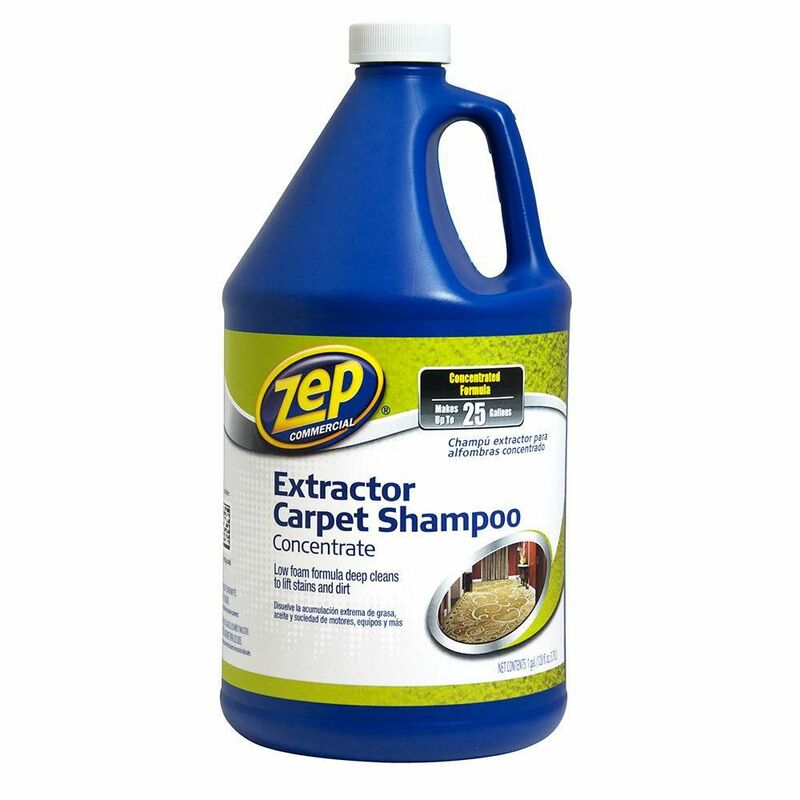 Taking the top spot, the Zep Carpet Extractor is a great, all-purpose shampoo that works best when paired with a dedicated carpet cleaner. The Carpet Extractor comes in a 128 oz. bottle that will provide enough shampoo for several rooms. The case of four individual bottles is enough to tackle most major cleanup projects around the house. 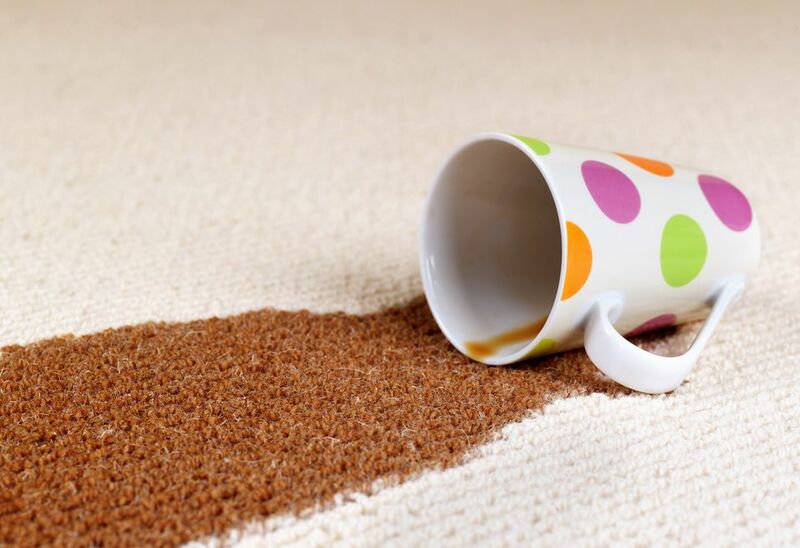 Using defoamers and stain/soil repellents, the shampoo will force debris and liquids to the top of the carpet where you can easily remove them with a little bit of water. Use with a carpet cleaner or damp cloth for the best results. The quality of many budget carpet shampoos can vary depending on the brand. If you aren’t careful, you might sacrifice great cleaning power for a smaller price tag which will fail to get the job done. The ZEP High Traffic budget carpet shampoo, however, retains the best properties of more expensive shampoos without breaking the bank. In fact, this is also one of the best options for areas that experience a lot of high traffic. Using a specially designed enzyme that eats away pet stains and odors, this shampoo can handle large amounts of mess and debris found in high traffic areas. With repeated footsteps attracting a lot of dirt and grime, a shampoo like this can tackle the high volume of grime without any issue. For the best results when using a carpet shampoo, you will need a machine capable of driving water through the carpet fibers to clean up liquid and debris. Since the combination of the shampoo and machine is important, it’s smart to find a shampoo that is specifically tailored to work with a machine for the best results. For machine-specific shampoo options, nothing quite beats the Hoover Deep Clean Pet Max shampoo. Specifically designed for pet odors and stains, this shampoo uses Hoover’s “Deep Clean” formula to get underneath the carpet fibers where dirt and grime likely reside. The 3-in-1 design is meant to go deep to eliminate stains and odors while providing a protective coat that will help to prevent future cleanups. If you don’t have a dedicated carpet cleaner or shopvac, the next best thing to get your carpets looking new again is a machineless shampoo. These shampoos work without any complicated equipment. Instead, all you have to do is apply the shampoo and some water directly to the carpet to begin scrubbing. The Carbona 2-In-1 Upholstery And Carpet Cleaner does double duty to clean both carpets and upholstery, providing an easy-to-use solution to keep in reach. The key to machineless carpet shampoos is having a way to dig deep into the carpet without the special bristles found on most carpet cleaners. The Carbona includes a built-in brush head that provides a deep clean through and past carpet fibers to deliver the shampoo straight to the source of the dirt. The shampoo is safe to use on furniture, the floor, and around pets so you can remove animal stains and odors as well. Odors in carpets are notoriously hard to get rid of since they can sink deep into the carpet fiber. Pets, in particular, can create odors that will stay in the carpet for months if not properly treated right away. To remove these odors, you need a carpet shampoo with a formula tailored specifically to remove the molecules that create the bad smell in the first place. The OdoBan 3-in-1 shampoo comes in a 128 oz bottle that will make 64 gallons of shampoo when combined with water. Unlike other odor “removers” than simply cover up existing odors, this shampoo completely removes the target odor so you are left with a fragrance free room. The shampoo is designed for machine-use for the best results and will work with virtually any deep carpet cleaner. Environmentally conscious individuals often try to stay away from traditional carpet shampoo because of the harmful chemicals they may contain. To help protect the environment and clean your carpets at the same time, you shouldn’t have to make sacrifices. The BioKleen Bac-Out Stain & Odor Eliminator shampoo uses environmentally friendly ingredients and a special formula to eliminate stains and odors from most carpets. The shampoo avoids the use of artificial chemicals, fragrances, or colors so the formula is completely natural. This makes it safe for people and pets with allergies or who are sensitive to certain types of chemicals. Using natural ingredients like lime peel, the shampoo still provides the same level of stain and odor removal as other carpet shampoos without the worry of harming the environment or your family. Most carpet shampoos come in giant bottles that can tackle an entire room’s worth of flooring. For the occasional spill or stain, however, this might be overkill. Instead, the better option would be a spot remover shampoo that is meant for the occasional cleanup. The Bissell Professional Spot and Stain shampoo is the perfect cleaner to keep around in the cabinets the next time you have a small carpet emergency that needs your immediate attention. The shampoo is designed to work and dry quickly on spot spills and stains. Using an eco-friendly formula that avoids the use of unnatural dyes, heavy metals, and other chemicals, the shampoo works with small spot cleaning machines for low volume cleanup tasks. The quick application also makes this shampoo a great choice for organic stains and odors caused by tea, fruits, wine, or vegetable oil as well.